Bixby is way more than a PA in your pocket. And now with Bixby Voice and Bixby Vision at the heart, you can interact with your Galaxy S9 or S9 in even more clever ways. Enjoy picture perfection in any light and shoot in Super slow motion. Samsung Galaxy S9 SM-G960 - 64GB - Lilac Purple (Unlocked) Smartphone (Hybrid. Condition is New. Dispatched with Royal Mail 1st Class. Scratched on front and back as pictured. Crack on rear also. No box or accessories. Works perfect. Cosmetic damage around edge. All damage pictured. Samsung Galaxy S9 SM-G960 - 64GB - Midnight Black (Unlocked) (Single SIM). Condition is New. Dispatched with Royal Mail 1st Class. BRAND NEW SAMSUNG GALAXY S9 SM-G960F 64GB LOCKED TO EE. Never got to use the S9 but kept it anyway as I thought might need it in the future. The phone has never been used, its good as new with original seals on the phone still intact. 5 out of 5 stars - BRAND NEW SAMSUNG GALAXY S9 SM-G960F 64GB LOCKED TO EE. 21 product ratings21 product ratings - BRAND NEW SAMSUNG GALAXY S9 SM-G960F 64GB LOCKED TO EE. Samsung Galaxy S9 SM-G960 - 64GB - Lilac Purple (O2) (Single SIM) NO RESERVE!!! Samsung Galaxy S9 SM-G960 - 64GB - Lilac Purple (O2) (Single SIM). Condition is Used. 5 out of 5 stars - Samsung Galaxy S9 SM-G960 - 64GB - Lilac Purple (O2) (Single SIM) NO RESERVE!!! 2 product ratings2 product ratings - Samsung Galaxy S9 SM-G960 - 64GB - Lilac Purple (O2) (Single SIM) NO RESERVE!!! I've been using the phone with the cracked screen for over 6 months. All working ok. Factory Unlocked for any network. (genuine Samsung model. not cheap Chinese copy). Condition is Used. However, it is in full working order as can be seen from photos. Locked to EE. Great phone just requires new screen but works great as is. Suitable for parts, spares or fit new screen. Samsung s9. Doesnt affect the use of the phone as it is smooth over the crack area. Samsung Galaxy S9 SM-G960 - 64GB - Lilac Purple (Unlocked) Smartphone. I will be including a total of four cases with the phone - one a hard plastic holographic case and the other three are stunning Ideal Of Sweden cases which are very stylish and not cheap to buy either! Samsung Galaxy S9 FULLY WORKING I dropped and smashed it Condition is Used. Dispatched with Royal Mail 1st Class. Samsung Galaxy S9 -Clone. - 64GB - Midnight Black (Unlocked) (Single SIM). This phone is in almost new condition. Unmark, ie; no scratches or cracks etc. Great looking phone. Cheap starting price. It's in very good condition and not quite a year old. One minor scratch on the screen which can only be seen in a certain light but apart from that it has always had a back cover. Condition is Used but good condition. The phone has always been looked after, It has never been dropped. The screen does have a few minor scratches which are only visible in bright light at a certain angle (as per the photos) - these are not seen when the phone is on or with a screen protector on. Samsung Galaxy S9 SM-G960 - 64GB - Midnight Black (Unlocked) (Single SIM). Condition is Used. Dispatched with Royal Mail 1st Class. SAMSUNG Galaxy S9 64GB 4GB RAM 5.8" Unlocked SimFree Smartphone - Midnight Black. The Samsung Galaxy S9 has an Infinity Display that's as beautiful as ever. Don't put up with blurry photos. Popped your phone down in a patch of water, or has it taken an accidental dunk in the sink?. Samsung Galaxy S9 SM-G960 - 64GB - Lilac Purple Unlocked to any Network. lines ,blobs or flickering. Condition is used but in great condition. Everything works as it should. I've had this phone for a little under 12 months and has always had a case on it for protection. Only reason for sale is because I have had an upgrade. Condition is Used. The phone is unlocked. 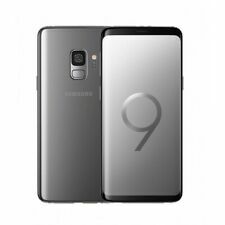 Title: SAMSUNG Galaxy S9 - (SM-G960F) - 64GB, Midnight Black, Unlocked. Make & Model: SAMSUNG - (SM-G960F). Open box, phone was used few weeks. All accesories including AKG headphones and EU charger are still in original packing. I will included UK charger as well (included on picture). In great condition as the pictures show. Had it for roughly a year or so before upgrading to an s10. It has been kept in a case and had a screen protector on since I first got it so it has no scratches or scuffs. As far as I know it's locked to O2, I bought the phone from carphone warehouse on contract with O2. Any questions feel free to ask. Thanks. Samsung Galaxy S9 SM-G960 - 64GB - Midnight Black (Unlocked) Smartphone. Dispatched with Royal Mail 1st Class. Samsung Galaxy S9 SM-G960 - 64GB - Coral Blue (O2) (Single SIM). Condition is Used. Dispatched with Royal Mail 1st Class. Samsung Galaxy S9 SM-G960F - 64GB - Midnight Black (EE) (Single SIM) Used sparingly over the past few months as i've had a new phone. Purchased in January 2019. Had a screen protector and cover on, almost new and excellent condition. If you have any questions please don't hesitate to get in touch. Samsung Galaxy S9 SM-G960F - 64GB - Titanium Grey (Unlocked). Samsung Galaxy S9 SM-G960F 64GB 4GB RAM Unlocked - Coral Blue - NEW. Condition is New. Dispatched with Royal Mail 1st Class. The Samsung Galaxy S9 is an advanced addition to the brand's flagship smartphone range. With an edge-to-edge display, a seriously powerful camera and a sleek, ergonomic design, this Samsung phone is a must-have device for any tech enthusiast. This advanced smartphone uses an ultra-modern Infinity Display that curves around the edge of the phone for a truly sleek and boundless style. With a 5.8-inch screen and 570ppi, the visual display is breathtaking. Pictures seem borderless and videos trail off the edges for an amazing viewing experience. The screen and bezel subtly join together to make for a full, unified look. The curved edges increase comfort, the camera to the rear is flush to the back of the case and a fingerprint scanner is ergonomically placed for easy access. Wireless charging makes charging your smartphone easier than ever, whilst a customisable amount of storage lets you add up to 400GB of storage space. A dual aperture camera takes professional level pictures in both low and bright light situations, whilst optical image stabilisation reduces any blur to keep your shots clear. The Samsung Galaxy S9 is water resistant, meaning you can use your phone in the rain or take it exploring. This model can handle up to 1.5 metres of water for up to 30 minutes. Samsung Knox adds several layers of protection to keep your data safe. An intelligent scanning system uses iris and facial recognition to unlock your device, alongside fingerprint or classic passcode systems. A mixture of a strong processor and matching RAM makes for a super-speedy performance to transition through apps with ease. Turn yourself into an emoji with this Android phone's advanced AR capabilities or use Bixby as an AR assistant that can identify places and products for an even easier way to search.